LOUISVILLE, Ky. (AP) — In Kentucky, parents have pooled money to pay an armed officer to begin patrolling schools. A mayor outside Cleveland, Ohio, is urging a security levy to pay for guards. And a town in New Jersey has begun assigning off-duty police to stand vigil inside all its school buildings. In the jittery aftermath of the shooting in Parkland, Florida, novel efforts to ramp up school security are flying fast as districts across the United States respond to heightened fears as well as threats and rumors of violence that have only seemed to multiply since the latest tragedy. American schools have been stepping up investment in security for years, and many districts have offered assurances about procedures already in place since the Feb. 14 shooting that left 17 dead. But some parents are saying it’s just not enough. In Monroe Township, New Jersey, 400 people crowded a meeting last week on school security, some rattled by rumors about an unsubstantiated threat online. The school system already has unarmed guards, but the mayor and police chief agreed to immediately assign armed, off-duty police officers to patrol each of the town’s eight schools. It’s expected to cost the town $200,000 for the first two months. Officials and parents have also come ahead with plans to introduce security cameras, metal detectors, door locks and other defenses. President Donald Trump has endorsed fortifying schools, to make them less appealing targets, and he repeatedly suggested arming teachers. In Kentucky, many were already on edge following a January shooting rampage that killed two students and injured 21 others at Marshall County High School. Since the Florida shooting, parents have been leading the way on fundraising efforts to boost security in local schools. A week ago, an armed resource officer took up duty at a 670-student campus in Barbourville, paid by parent donations for at least the rest of the year. Barbourville Police Chief Winston Tye said it was a couple of parents who approached him with the idea and they’re working on raising money for next year. “They said that would make their kids feel better, all the kids feel better, and make them feel better,” Tye said. Shane Romines, a Kentucky father of two 6-year-olds in kindergarten, announced two days after the Parkland shooting that his law office would donate $25,000 toward metal detectors in Knox County schools. When he reached out to school officials, they said they were also in need of funding to replace a grant so they could keep school resource officers. The effort, which has drawn support from other businesses and parents, has so far has raised more than $50,000. State legislatures are considering new measures. Kentucky Gov. Matt Bevin said on a radio interview Thursday that he expects to push for changes in state law and is leaning toward allowing more guns in schools with beefed-up training. Arkansas Gov. Asa Hutchinson signed an executive order Thursday forming a commission that will look at school designs, security policies and mental health. Its initial report is due by July 1. The range of products available to schools includes bulletproof doors and backpacks, and even bunkers decked out with cameras and air filtration systems. School officials in Healdton, Oklahoma, in recent years have purchased nine such pods that can turn classrooms into fortresses capable of withstanding fire from high-powered rifles. Around the country, many of the proposals for immediate action have come from parents, elected officials or police, and not education leaders, who have seen security costs take up an ever larger amount of their budgets. With most school districts strapped financially, security expenses threaten to take money away from instructional programs, according to Dan Domenech, executive director of the School Superintendents Association. There is also debate over the effectiveness of investments in hardware and additional security staff. In reviews of shootings, school security expert Kenneth Trump said, fault-finding generally focuses on allegations of failures of people and procedures, and not hardware or products. While many have emphasized fortifying schools, especially since the 2012 shooting at Sandy Hook Elementary School in Connecticut, he said districts often would be better served by investing in prevention strategies and school counselors. While some have proposed that states do more for school security, as Florida’s governor has done with a request for an officer inside every school, others are turning to local taxpayers. 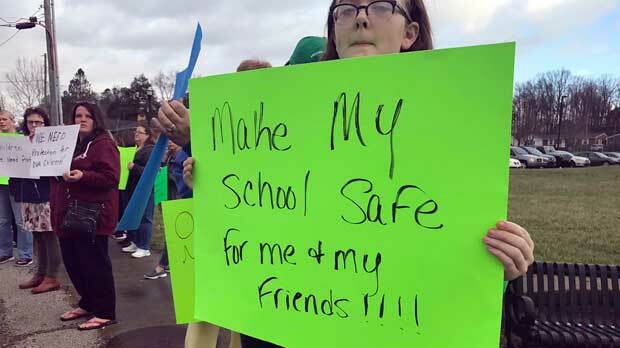 The mayor of Streetsboro, Ohio, Glenn Broska, said he would support asking voters to approve a “security levy” to generate $500,000 or more to fund two armed security guards at each of his town’s four schools. The proposal received some support while other parents questioned whether the benefits would outweigh the risks, such as an accidental discharge of a firearm. Associated Press writers Kantele Franko in Columbus, Ohio, and Mike Balsamo in Los Angeles contributed to this report. Melia reported from Hartford, Connecticut.